Have you ever had an argument in the middle of a Costco freezer? My wife and I have. So imagine this: you walk into the open freezer at Costco to grab some milk. There are two mountains of milk boxes stacked up next to each other. The stack on the left has an expiration date 14 days from now and the stack on the right has an expiration date 16 days from now. Which milk do you reach for? You reach for the stack on the right. We want to have the milk which last the longest at home. Costco, especially the one in Sunnyvale CA, is the worst place in America so we want to go the longest duration in between visits to this horrendous place. Also, since milk has a quick shelf life, we don’t want to have Costco sized double milk jugs rotting in our fridge because that’s just gross and wasteful. Also, why do we keep buying so much milk? Aren’t there articles out these days about how we shouldn’t drink so much cow milk? Okay internet, whose team are you on? Team Left Stack or Team Right Stack? Comment and tell us why. Be sure to follow the shenanigans on Facebook, Instagram, and Pinterest. You can email me directly to say hello too! 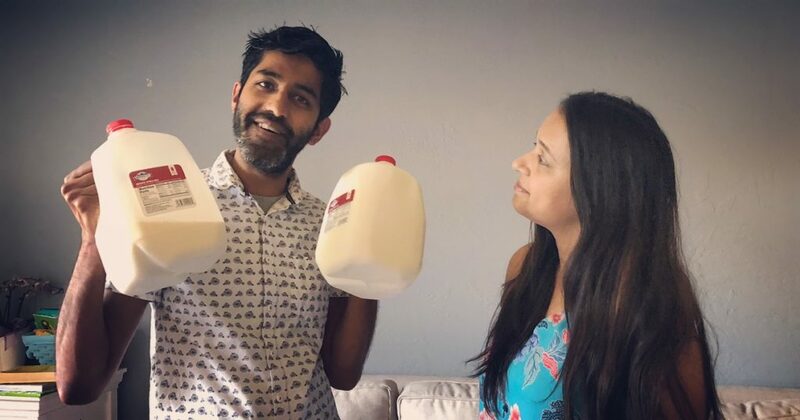 I had a friend from the UK consistently comment on the size of our milk here in the US. So quantity vs consumption is also an issue here. But I always skew right stack!